Exiled Syrian artist Najah al-Bukai poses with a ball-pen drawing that stems from the haunting memories of the torture Bukai says he went through and witnessed when imprisoned twice in Syrian government jails, in Yerres, near Paris, Sept. 13, 2018. 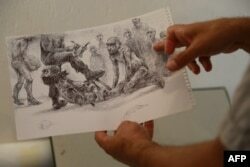 A Syrian artist draws sketches of colorless, broken and undefined features in an attempt to cope with the horror and trauma of his time in prison, where he was subject to constant torture and abuse by Syrian government forces. Najah al-Bukai draws images from the time when he was arrested, detained and tortured by the Syrian regime in one of the notorious prisons in the Syrian capital, Damascus. “Drawing my experience relieves me from my nightmares, and this continues to develop as a healing method,” al-Bukai told VOA. He said his goal is not to document the events but rather to use drawing as a mechanism to heal from the physiological wounds and trauma he sustained during his time in the prison. Drawing on a paper, al-Bukai relies on his memory to recall images from inside the prison. He then re-creates them in an effort to come to terms with the experience. “People might not look at a graphic photograph taken of a horrific situation, but when it is an artwork people react differently. They do look at it and feel compassionate about the subject of the artwork,” al-Bukai added. Al-Bukai, who lives in Paris, was a college professor from Homs in central Syria. He studied art in France and returned to Syria in 2006 to teach art and mass media at Damascus University. He owned his own art studio in the Syrian capital. When the uprising started in 2011, al-Bukai took part in peaceful protests in a number of Syrian towns to demand political reforms and more rights for Syrians. In 2012, when the Syrian government intensified its crackdown on opposition protesters and groups, many Syrians were displaced and al-Bukai started volunteer work to deliver aid packages to the besieged areas in the Damascus countryside. That is when he was arrested for the first time. “I was taken to security branch 227 and accused of weakening the national sentiment. I was imprisoned for one month in which I lost 13 kilos [about 28 pounds] because the prisoners are barely fed,” al-Bukai said. “After my release I went into hiding at an acquaintance’s house in Damascus,” he said. Branch 227, also known as Al Mantiqa security department, is in Damascus. It is part of a number of intelligence branches in the area where Syrian regime opponents are interrogated using torture and other brutal techniques. In 2014, after keeping a low profile and mostly living in hiding, al-Bukai was frustrated and decided to go to Lebanon. Before making it to Lebanon, he was arrested for a second time on the Syrian-Lebanese border and was taken to the same security branch where he was kept two years earlier. He said he was kept there for 70 days before they transferred him to Damascus’ central prison in Adra town, northeast of Damascus. Al-Bukai says he was tortured physically and psychologically. He was electrocuted, brutally beaten, starved and hanged for hours from his hands. He says he also witnessed the torture of other detainees, with some tortured by what he termed “the German chair” technique, in which prison guards broke the backs of detainees, paralyzing them. Among all the horrific memories, al-Bukai says one image stands out. It is the memory of detainees carrying the bodies of those who died under torture. The image is reflected in many of his drawings as well. “Everyday evening around 8 p.m., a truck full of dead bodies arrived to branch 227 from other detention centers. The security officers would order a number of detainees to go out and empty the truck. We used to go out in our underwear with a green wool military blanket to carry the dead,” al-Bukai said. Al-Bukai added that the bodies were kept in the basement of their branch for the night and in the morning those who died under torture from their branch would be put with them and taken away by a truck. “A security guard told us that the dead [bodies] were taken to Najha public cemetery [on the southern outskirts of the Syrian capital],” al-Bukai said. “We heard the screams of those who were tortured, the cracking of their bones, and we heard their moaning as they were slowly dying, and we hoped that they die sooner so they finally could have some peace,” al-Bukai said. Drawing memories became a visceral habit for al-Bukai. He believes he will not be able to stop the drawings because they are part of his life and experience now. “Once you live through this experience, it will stay with you. I cannot stop the images of what I saw from appearing in my mind, and drawing these images over and over again became an obsession. 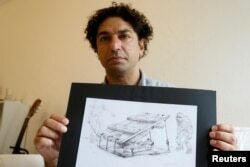 Drawing helps me in healing and coping with the pain,” al-Bukai said. Al-Bukai added that the detainees who went through similar horrors tend to talk about their experiences repeatedly, but after a while, those who listen to them get bored of the repeated stories. “For the tortured detainees, silence is a black box in memory. 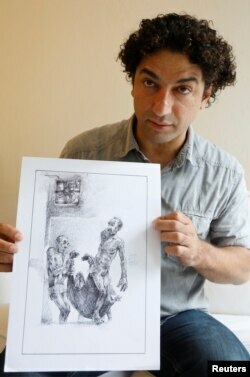 I talk through my drawings,” al-Bukai said. Syrian artist and painter Najah al-Bukai presents his work during an AFP interview, Aug. 20, 2018 in Yerres. France. Tens of thousands of Syrians have been reportedly killed by the regime forces inside different prisons in the country. The Syrian Observatory for Human Rights, a U.K.-based rights group monitoring developments in Syria since 2011, has documented more than 140,000 cases of people being detained by the Syrian regime. The group has also documented the deaths of more than 60,000 civilians in detention centers during the seven-year war in Syria, including women and children. They died because of torture, starvation and lack of medicine. VOA could not independently verify the authenticity of these figures.